New product offers innovative consumer solution for faded, stained, or outdated patio & pool furniture, featuring a line of brilliant designs that custom-fit over old cushions to look like new – saving money, time, and reducing waste while helping protect the environment from toxic synthetic cushion materials. 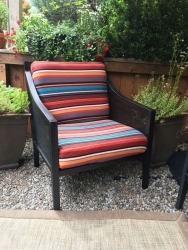 Portland, OR, April 09, 2019 --(PR.com)-- An innovative new solution to tattered, stained, or out-of-date outdoor furniture cushions, Fig Leaf Cushion Covers has launched its 2019 line of fashionable cover designs. The first product of its kind, Fig Leaf Cushion Covers offer consumers a way to save money and the environment by refreshing outdoor patio or pool furniture with stunning new cushion designs that form-fit to look like new. Older, but still completely functional cushions can now last years longer rather than being dumped into landfills, plus they allow consumers to change up the style or color themes of their outdoor furnishings at any time. Fig Leaf Cushion Covers offer easy-to-apply solutions for all types of outdoor furniture, just in time for spring and summer lounging and entertaining. Revitalizing cushions that are faded, torn or simply could use a fresh design also comes at a fraction of the cost of buying new cushions or a completely new set of furniture. Even better, the variety of colors and patterns mean consumers can now change up the look or theme of their outdoor hosting areas at a whim by having multiple styles on hand. Outdoor furniture can be customized in just minutes to perfectly suit the season, celebration or holiday themes, or simply to keep things fresh. Fig Leaf Cushion Covers come in a wide range of stylish solid and print patterns, and a bold and colorful line of modern looks featuring a stunning selection of contemporary styles. Or, mix and match designs to create unique combinations to suit your own personal taste and home décor. Available in a variety of colors, styles, and fabrics, Fig Leaf Cushion Covers are manufactured entirely in the U.S.A. Available through direct-order for home delivery, the cushions securely form-fit over most any standard-size cushion shape and size. Fig Leaf sells directly to customers through its online store (FigLeafCushionCovers.com). The site also features convenient sizing charts, custom-size orders for non-standard cushion dimensions, and other custom-order features to accommodate consumer requests. Company founder interviews and high-resolution photography featuring Fig Leaf products are available upon request. Background info on the product's invention and development, plus frequently asked consumer questions.